After celebrating Mass for our guests, Msgr. Kozar hosted a reception that focused on CNEWA’s work in Ethiopia and Eritrea. Msgr. Kozar shared his reflections and stories of his recent trip to the region, and highlighted the agency’s work and goals for the peoples and churches there. Thank you to everyone who attended this morning — and thank you, especially, for supporting our good works in the Horn of Africa! Lent is a wonderful opportunity to renew your body and spirit, and to place yourself in service before the Lord and his church. I pray my words help you on your Lenten journey — and stir you to make a generous gift for the Eastern Catholic churches and their ministry to the poor. You can offer your Lenten dedication to CNEWA here. Yesterday, many of us in the U.S. celebrated the mothers in our lives for Mother’s Day. With the help of CNEWA, one place where mothers are getting a lot of support is Jordan. At the Mother of Mercy Clinic in Zerqa, Jordan, mothers receive care both before and after their children are born. The clinic, run by the Dominican Sisters of St. Catherine of Siena, serves predominantly Muslim patients. It’s here where young women get the help they need in taking the first steps to begin motherhood. CNEWA has supported the clinic for many years. In 2011, the clinic saw an increase of 4,159 new patients. 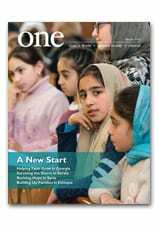 To learn more about the clinic, check out Mothering Mercies, an article from the May 2009 issue of ONE. A Syrian boy and other refugees who fled the violence in Syria are seen at a temporary shelter in a school in the Wadi Khaled area of northern Lebanon 7 March. In a March 7 telephone interview with Catholic News Service, Bahou said there are no official statistics, but an estimated 200 Christians were among the recent wave of Syrian refugees entering Jordan. He said many of those same refugees earlier had fled Iraq for Syria. “They are refugees from one country to another. It is everywhere now, not just in Jordan. Also in Lebanon and Turkey. This population movement is also creating a changing Middle East,” Bahou said. For more read, Syrian Christians Fear Persecution. To learn how you can help Syrians, visit our website. The project has jump-started the local economy and is helping to revitalize Deir El Ahmar. Residents have pooled money to build a new church dedicated to St. Charbel. Still under construction, the Maronite church stands on a once desolate lot. Now, a lush, landscaped lawn and garden cover the grounds. On summer afternoons, locals often gather on the cool lawn in the shadows of the church to relax and take refuge from the sun’s sweltering rays. The reservoir is just one of many water projects the Pontifical Mission has spearheaded in Lebanon since 1993, when it became a key nongovernmental partner in the country’s post-war reconstruction. In the early days, the agency focused on restoring damaged water systems in rural communities, to ensure clean drinking water as well as to irrigate farms. In recent years, projects also include water collection and sewage treatment. For more, read Springs of Hope in Lebanon featured in our January 2012 issue. My first visit of the day was to meet with our staff in Jerusalem. They were all waiting to greet me and certainly made mefeel most welcomed and at home. As I was introduced by Sami, our regional director, I went around to all the offices and took photos of the team. We had a great meeting together and this afforded me an opportunity to introduce myself and share with them some of my goals we would pursue together down the road. It was also rewarding to listen to each one tell me of their work; Sami obviously sets a very collaborative tone with them and they work well as a family. From this most satisfying office visit, we walked to the offices of His Beatitude Patriarch Torkom II of the Armenian Apostolic Church in Jerusalem. He received us most cordially and immediately offered me his prayerful bestwishes. He was most charming in our visit. He is 93 years young and has been patriarch for two decades. Among his many accomplishments was a proficiency in athletics; he’s a great hiker and musician, and proud of the fact that he lived more than 20 years in the United States, including California, New York and Chicago. For a man of his age, he had amazing recall of many details of his career. Joining us was Archbishop Aris Shirvanian, who directs the patriarchate's ecumenical and foreign relations outreach. He, too, was most cordial and shared more details about the patriarch and the richness of his long life. I thanked the patriarch and he asked when I would be coming back for my next visit. He was gracious in giving us a blessing as we said goodbye. From this visit, we headed to a busy market area and found the entrance to the Wujoud Center, a facility that offers training and empowerment for Palestinian women, especially Christian women. There are training and employment opportunities in classic Palestinian embroidery, cooking, painting, woodworking and a whole variety of self-help skills. The center is run by a dynamic lady named Nora Kort, who is the embodiment of a community organizer and advocate. She is a real charmer, an elegant woman who does not like to take “no” for an answer. We have collaborated with her on a number of programs and the partnership is most fulfilling on both sides, as affirmed by both Nora and Sami. She introduced us to about a dozen ladies. Some work with her as community leaders in the walled city of Jerusalem or benefit from the center's many programs. Some of the women, including a few Muslim ladies, told their stories of how they were able to secure employment and a new lease on life through the participation in programs at this center. And of course, there was food, plenty of it in the form of a banquet lunch — all homemade Palestinian dishes. We expressed our gratitude to the ladies and both Nora and I reaffirmed our commitment to collaborate in supporting these self-help programs geared to help the Palestinian Christians remain in their hometown of Jerusalem. From our big lunch, we went to the offices of the Coptic Orthodox Metropolitan and Vicar of Jerusalem, His Grace Anba Abraham. Although the archbishop has some challenges with his vision, he was a most congenial and humorous host. His wit was very sharp and he expressed his faith-filled thoughts to us, sometimes with humor and a hearty laugh. When I was asking him how he is able to work in the midst of so much conflict, strident personalities and social, cultural and religious divisions, he gave a great answer: “Monsignor, it is no different than a bishop or a pastor in one parish or diocese having to work with his neighbors in other parishes or dioceses.” He also affirmed that everything is in God's hands. After a good visit, we tried to go on to our next appointment, but Anba Abraham insisted we stay awhile longer and have something to eat or drink. I think he really enjoyed our visit and he, too, pressed me about when I would be back to visit again. By the way, I have to make a comment about Father Guido. Everywhere we go in the Old City, people come up to him with a warm greeting: “Abuna Guido!” and give him a big hug. I asked him if he was running for mayor of Jerusalem, he is so very well known and beloved by so many people here. Our final visit of the day was with Patriarchal Vicar of Palestine Bishop William Shomali. As the only Palestinian bishop in the Holy Land, he is entrusted with the spiritual care of the Palestinian people in the West Bank, East Jerusalem and Gaza, the areas that make up what is Palestine, at least unofficially. The bishop was actually standing in for the Latin patriarch, who was called to Jordan yesterday and could not see us today. However, we are having dinner with him on Wednesday, and I will be spending much of Saturday with him, as I have the honor of accompanying him in a procession to Bethlehem for the Mass of Midnight for the Christmas celebrations. Of course, there will be much more on this privilege after it happens. I just had a first look at the Basilica of the Holy Sepulchre, the site of the death, burial and resurrection of Jesus. Of course, I will have time later in the week to visit there and the other principle holy sites and I will be sure to share all ofthat with you. I continue to remember all of you in my prayers as I live out the biblical stories in my pilgrimage. Every now and then, we hear stories of how CNEWA has been able to help people in surprising, sometimes unexpected ways. This week, we heard about one case — involving three countries, one young woman and one generous family. Eighteen-year-old Zeina Nasraween from Jordan suffers from cerebral palsy, which severely impaired her legs and hands. In October 2010, her family approached CNEWA’s regional office in Amman for help in securing affordable housing in Germany, where she would undergo several months of medical treatment. In response, Father Guido Gockel, CNEWA’s vice president for the Middle East, contacted a family in the Netherlands, who paid for the family’s stay in Germany. After arriving in Germany, Zeina underwent reconstructive surgery on both her legs and received nearly six months of intensive physical therapy. The result: last month she was able to return home to Madaba, Jordan able to walk without a cane and use her hands fully for the first time in her life. Family, friends and colleagues greeted her when she came home, and were astounded by the improvements. “We didn’t realize how tall Zeina was before because she could never fully stand on her own. Now that she can stand and walk, we have discovered that she is quite tall,” said her sister, Nisreen.